A cool remix of Black American Music takes place in downtown Durham for a weekend festival of forward-thinking Jazz, alternative Soul and mature Hip Hop. The mission of AOCFEST is to expand the audience for jazz, while championing innovative thought around music and culture. This experience will draw over 10,000 music lovers to the vibrant city of Durham, NC as a destination experience for all. 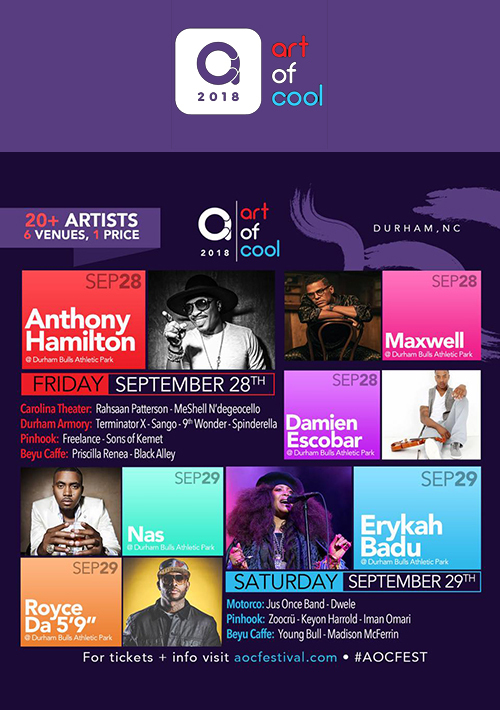 The 5th Anniversary AOCFEST will feature Nas, Erykah Badu, Maxwell, Meshell NDegeocello, Rahsaan Patterson, Dwele, Sango, Iman Omari, Damien Escobar, Sons of Kemet, Durham’s own 9th Wonder featuring Spinderella, and many more to be announced! Venues: Durham Bulls Athletic Park (DBAP), The Durham Armory, The Carolina Theater, The Motorco, The Pinhook, and more!